In response to student requests, CollegeOnTrack has added Course Requirements to the company's college planning platform. The new addition shows entrance requirements for all colleges on a user's Wish List in one place, so students can avoid surprise shortfalls at college application time. Applying to college...requires a long term strategy. 8th-grader Eric is already thinking about graduate school. He's interested in medicine, and the college he chooses has to prepare him for a top-flight medical school. He was considering his college planning strategy as he studied the Palo Alto High School (Paly) course catalog with his mother, mapping out a four-year plan. Eric is bright and logical, so he worked backward. He chose colleges he'd want to apply to as a senior, then scoured the guide books and web sites to collect all their entrance requirements. It took hours, but eventually he had enough information to choose high school classes that would qualify him for any college on his list. Most high schools give entering freshmen a list of class requirements for for graduation. Some, such as Paly, also list entrance requirements for the University of California and California State University systems. It comes as a shock then to many students that they can fulfill such lists, even at very demanding high schools, and still not meet the course requirements or recommendations of top colleges. When they discover this in their senior year, it's too late to do anything about it. College Consulting International founder Georgia Fox says, "It is always a challenge to work with students who have not received the necessary information early enough to develop a plan. ...Applying to college ...requires a long term strategy." Nearly 4 million U.S. 8th-graders will be in Eric's shoes this Spring, planning their high school classes. Educators concerned with American competitiveness are encouraging them to think ahead, so they'll be prepared for the intensely competitive college application climate that awaits them. That part of college planning just got easier with Course Requirements: a new feature of the CollegeOnTrack planning platform, which entered the market last January. It's a simple extension with a big impact. CollegeOnTrack's Mindset of Success process urges students to start in 9th grade or earlier, thinking about their interests and how they might pursue them in college. They can find colleges that meet criteria ranging from specific sports offerings to learning disabled support, then add those schools to their Wish Lists. As they do, they see the entrance requirements for all their colleges on the Course Requirements page. It's easy to figure out what class choices will allow them to successfully apply to their dream schools. This type of data has always been available, but now that students can see it all in one place, they can really use it to plan. Course Requirements are now part of CollegeOnTrack at no extra cost. 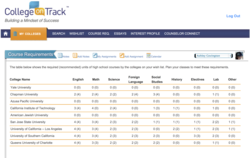 See this new feature at http://www.CollegeOnTrack.com. CollegeOnTrack was established in 2010, to provide college planning tools for families, schools, and counseling firms. It offers a combination of comprehensive college data, collaboration support, and task management that helps students create strong applications while reducing family stress. The company was a semi-finalist in the 2011 Berkeley Business Plan competition. CollegeOnTrack ran successful tests last year at Wilcox and Independence High Schools in Santa Clara County, where students and teachers have been enthusiastic about the product. It was released to the public in January, 2012. For more information about this topic, or to schedule an interview, contact Philip Roybal at (408) 782-4244, or phil(at)collegeontrack(dot)com.